Water and air are two of the five elements (Panchamahabhuta), which influence the preservation of the structure of the body in the right shape and size. Unnatural retention of these elements is a reason for weight gain. From an Ayurvedic perspective, maintaining the balance of water and air inside the body is the key to losing weight. Hot water is called Amrutha, which means it can provide you with longevity and prevent diseases. It also stands for the material that helps to cleanse the body from toxins. From the point of view of Ayurveda, the cause of weight gain is associated with a vicious cycle. Obesity begins with an irregular diet and lifestyle that lead to the disturbance of the digestive fire, which increases the formation of Ama (bio-toxins). This interferes with the tissue fire of the adipose tissue (Meda Dhatu Agni) and blocks the formation of further tissues. The violation of tissue layers due to problems with Medа Dhatu, which increases the volume of adipose tissue, leads to an imbalance in the Kapha energy. This in turn increases the accumulation of toxins (Ama), which leads to imbalanced Meda Dhatu. All these accumulated toxins block the free movement of Vata, which prevents this energy from managing the digestive fire. You begin to feel hungry, taking more food, but due to the slow metabolism everything turns into bio-toxins or unbalanced Meda. The vicious cycle becomes more and more serious. That is why it is hard to lose weight. The treatment of obesity in Ayurveda is not just limited to weight loss or losing centimeters, but it is also about removing Ama (toxins), Kapha dosha and excess fat without any Vata vitiation. It is important to correct irregular metabolism and to strengthen the digestive and tissue fire. You will need to cleanse your body channels and to improve your eating habits as well as to correct inappropriate daily practices, which in turn will help you reduce stress. Hot water is prepared by heating water over fire until it is reduced to one eighth, a quarter or half of its original volume, or just heating the water until reaching boiling point. The process of heating makes water easy for digestion. Boiled water is light for digestion, and it increases heat in the body. Moreover, it intensifies appetite and speeds metabolism up. It helps to pacify Kapha and to eliminate bio-toxins through urine. You may drink boiled water immediately after it has cooled if you already have excess heat in your body (Pitta constitution): this will not raise the heat in your body while the water will be light for digestion. Boil 1 liter of water until it is reduced to 250 ml. Such water is a remedy to manage Kapha. Drinking hot water before meals (30 to 60 min) helps to ignite the digestive fire and allows the free movement of Vata by stimulating intestinal functions. How Does Hot Water Help Weight Loss? 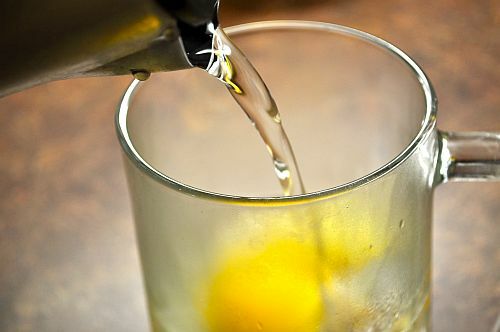 Drinking hot water speeds metabolism up. Drinking hot water before bed helps you to digest the food and stimulates your intestinal function to better remove toxins. Drinking cold or room-temperature water immediately after eating leads to weight gain, while drinking hot water before and between meals helps you to lose weight. Drinking hot water during fasting does wonders for the intestinal function and tones the digestive system. Using hot water in small doses (for instance 150 ml) strengthens the digestive fire, which helps destroy toxins or undigested food substances. You must take care to avoid Vata imbalance during fasting. Mung bean hot broth can be a good alternative to hot water. Prepare it by boiling a tablespoon of green Mung bean in 750 ml of water until it is cooked. This broth can be taken instead of hot water during fasting. The intake can continue until the complete elimination of bio-toxins, which could take from one day to several weeks. Drink this water sip by sip because it is hot. Do not overdo the quantity as the maximum water intake for the day should be calculated according to the Ayurvedic standard known as Anjali Pramana. Anjali is the cavity formed by putting the hands side by side, hollowing the palms. The amount of fluid that fills up this cavity is counted as one Anjali. A maximum of 10 Anjali of water per day is allowed. Further expert advice can be obtained from any Ayurvedic practitioner. Drinking medicated water can also be useful. Variations include lemon juice with hot water, water with honey and lemon, ginger water, Musta (Cyperus Rotundus) water, coriander water, etc. Hot water consumption enhances the resilience of the intestines and improves muscle tone, which results in better peristaltic and optimal elimination of toxins. The main treatment of Ama is Langhana (fasting), which normalizes the digestive fire (Agni). In turn, normal Agni reduces any obstructions of the ducts and breaks down Ama and thus all the symptoms caused by Ama (such as increased body weight, lethargy, sticky or unsatisfactory stool) are reduced. Hot water raises body temperature, which speeds up the rate of metabolism and the excretion of urine. An increased metabolic rate allows the body to burn more calories throughout the day. Hot water helps to alleviate the pain of menstruation induced by cramping. Heat is known to have a calming effect on the abdominal muscles, which can help reduce spasms in the muscles of organs. Any tension or bloating felt during the elimination of waste is caused by a lack of water in the body. Drinking a certain amount of hot water in the morning on an empty stomach can help improve bowel movements and relieve constipation. Drinking water adjusts the digestive fire and improves adipose tissue processes. That is why drinking water helps to fight dry skin and slows aging down. When Should You Avoid Drinking Hot Water? You should not drink hot water after excessive alcohol intake. People with a Pitta constitution (Prakruti) should be extremely careful when drinking hot water. They can drink medicated hot water following a prescription by an Ayurvedic practitioner. Hot water should be avoided in case of dizziness, burning sensation, delirium, or diarrhea. Previous Post: Does Ayurveda heal psoriasis? Next Post: How to control cholesterol with the help of Ayurveda?